The day I got rid of my overly used diaper bag, I had a little party. The party was mostly me going out to buy a new grown-up purse followed by an awkward happy dance in my kitchen as I loaded it up with all of my stuff. 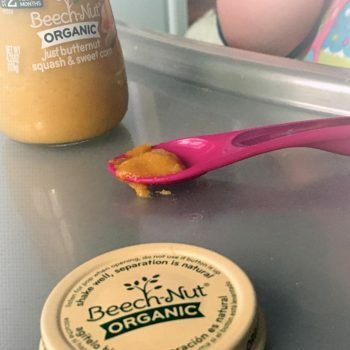 What I found out that day is 1) my diaper bag was seriously loaded with way more food crumbs than I thought imaginable and 2) while I didn’t need a diaper bag anymore, I still needed some of the items in there—a few backup diapers, wipes, sunscreen, etc. But I was determined not to let my girls’ stuff take over my new purse, I had some serious editing to do. After many trial and errors (lots of errors leaving me with no diapers or emergency snacks) I finally got a system in place. 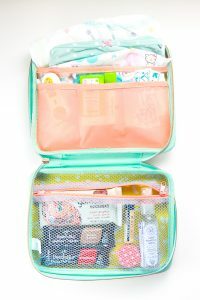 My new fail-proof system is beyond easy and simple—it’s a small zippered bag that is loaded with everything that I absolutely need on a day-to-day basis for my girls. The key is to have a bag with a zipper so that you can only take so much stuff with you. I find that I still have to carry a spare diaper (these will hopefully be gone from my life forever in a couple of weeks! ), wipes, bandages, sunscreen, emergency snacks for all of us, hair ties for me, hand sanitizer and a couple of other essential items. The great thing is that I simply toss my pre-packed kit into any purse or backpack that I am taking along for the day and I know that we are good-to-go for whatever comes our way. Just remember to restock any items you have used when you get home! Diapers or Underwear—or both, depending on the age of your children. I usually pack 1-2 of each. When I am in the trenches of potty-training I also pack a separate plastic baggie filled with a complete change of clothes—the clean clothes go on my little one and the dirty clothes go into the baggie to get washed. Small Pack of Wipes—I like to use a refillable packet of wipes so you can just take about an inch of wipes with you at a time. The more wipes you have, the bulkier your kit will be. Bandages—these are a must-have item for me because I swear I can fix anything from a simple skinned knee to a full blown tantrum with a simple bandage. If only a simple bandage could solve all of my little ones’ troubles in their teenage years. Antibiotic Ointment—a small antiseptic spray for the times they actually get a cut. Sunscreen—I like to carry a sunscreen stick and lip & face balm stick because they won’t explode in your purse like some other tubes of sunscreen will. In the summer months, I also carry a bigger tube of sunscreen for all of us to use throughout the day. Emergency Snacks—this is the one thing we go through the most. Of course, I pack a ton of snacks each day for whatever outing we have going on, but for some reason what I pack is just never enough for my growing girls. 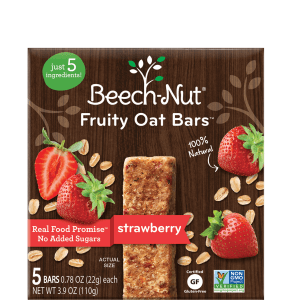 They love the Beech-Nut Quinoa Crispies and Fruity Oat Bars the best! Hand Sanitizer—I prefer to have the girls wash their hands with regular soap and water, but there are times when we are somewhere that this method just isn’t possible. In those cases, I prefer a natural hand sanitizer. Small Toy—This one isn’t pictured but sometimes I will toss a very small toy in my kit just in case I need to distract my toddler for a couple of minutes. Natural Medicines—there are some common ailments that can strike at the most inopportune times, like stomach discomfort or a cough for your baby. 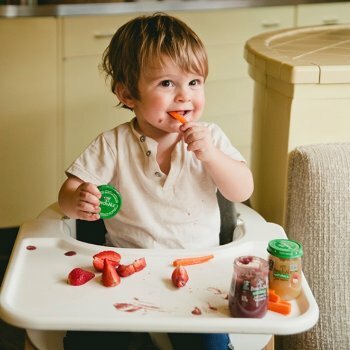 We like the effective, safe products from Mommy’s Bliss like their Gripe Water (which helps ease stomach discomfort associated with gas or colic) or their Organic Baby Cough Syrup (made with organic agave syrup, chamomile, and lemon balm). Favorite Lip Balm or Gloss—for chapped lips or to simply make you feel like you actually got ready and aren’t just in your yoga pants from the day before. Energy bar—for when I forget my own snack, which happens all-the-time. Small Container of Medicine—I like to have a small container of ibuprofen and allergy medicine on hand just in case I need it while I am on the go. Hair Tie—when you need one, you need one NOW! Tampon—again, when you need one, you need one NOW! Pack of Travel Tissues—I never carry these but always wish I did. 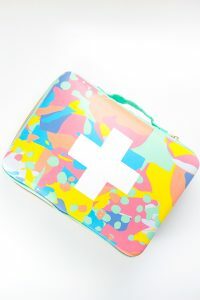 I found the one pictured above from Oh Joy! at Target. But I have also used small zipper bags from Old Navy and Target from the purse section.